Many of the opportunities in the virtual world are not available in the physical world, others open our eyes to real world opportunities we couldn’t imagine and teach us vocabulary and skills applicable to the real world. This chapter explores some of the connections between virtual decisions and real consequences, as envisioned in thought experiments of early philosophers from both eastern and western traditions. Massively Multiplayer Online Games (MMOGs) such as Blizzard’s World of Warcraft (WoW) or Sony’s Everquest 2 (EQ2) are worthy of investigation because of their cultural significance and immersive potential due to the interactivity within the game. MMOGs are great laboratories for ethics and can afford a better understanding of human nature. They allow for risks and rewards, social interaction and unique scenarios that can help provide insight into the consequences of our choices. Many of the opportunities in the virtual world are not available in the physical world. They raise many ethical issues that have existed since antiquity yet through a dynamic and interactive perspective. For example, if you look at the MMOG subscriptions on the chart at MMOGChart.com (Sir Bruce, 2007), you will see that WoW has over 10 million subscriptions. The peak in subscriptions for Lineage, which is the next highest, was over 3 million. Most MMOGs are under 500,000 in total subscriptions but have many fervent supporters. Moreover, MMOGs offer a venue for exploring philosophical ideas not readily or safely available in real life (RL). Through community raids, guild chats, Player vs. Player (PvP), fighting zombies, skeletons and other life forms including your own, and many other areas, the player is able to explore extraordinary choices and options; generally without the dire consequences of Real Life (RL). Whether a player chooses to help, grief, ally with or fight a real or artificially intelligent character, ethics are embedded within each consequential choice. How the player communicates, shares, teases, and fights or rescues can demonstrate kindness, cruelty, bravery or recklessness and a host of other virtues or vices. Games can provide a controlled exposure to ethics for kids, a point demonstrated by the PBS SHOW: “The Values in Video games,” (PBS, 2003). Like movies and television, before them, MMOGs can be viewed as vitally important cultural influences and products, and their agendas and lessons can be understood, appreciated and criticized. As the Internet grows in popularity and computing resources steadily increase, more people worldwide will interact in MMOGs, be influenced by them and be able to mod(ify) them. This is especially true in emerging economies like Brazil and China where internet growth and online gaming are on the rise. For example, looking at the statistics on Internetworldstats.com (Miniwatts Marketing Group, 2009), you’ll see that China has the highest number of Internet users, with 298 million. India has the fourth highest numbers, with 81 million, and Brazil follows with 67.5 million but China and Brazil are two of the fastest growing fed in part by their a passion for computer games. Much of the internet growth in these economies is driven by MMOGs in particular and the players will be shaped by this new, engaging experience. 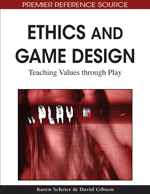 In this chapter, I review a number of philosophical frameworks that offer different ethical systems and options for considering the role of ethics in MMOGs. These frameworks aim to contribute to a better understanding of how to make informed choices in the real and virtual worlds. Going through life without a philosophical framework is like playing WoW without QuestHelper. QuestHelper is a very popular tool from Curse.com for navigating quests and geography in Azeroth, the world of WoW. Many people use QuestHelper to help guide them through the overwhelming world of Azeroth; filled with multiple choices, paths, possibilities and dangers. Likewise, during our everyday existence, without a philosophical framework, we are left with inadequate information to make informed choices and an unclear map in which to plot a course of action. Using such a framework in the real world helps us make decisions and navigate through life’s challenges, questions and hopefully, not too frequent issues of life and death.